Google Chrome does a splendid job of showing PDF’s inside a browser window so you can read/search/save/do-what-ya-gotta-do. 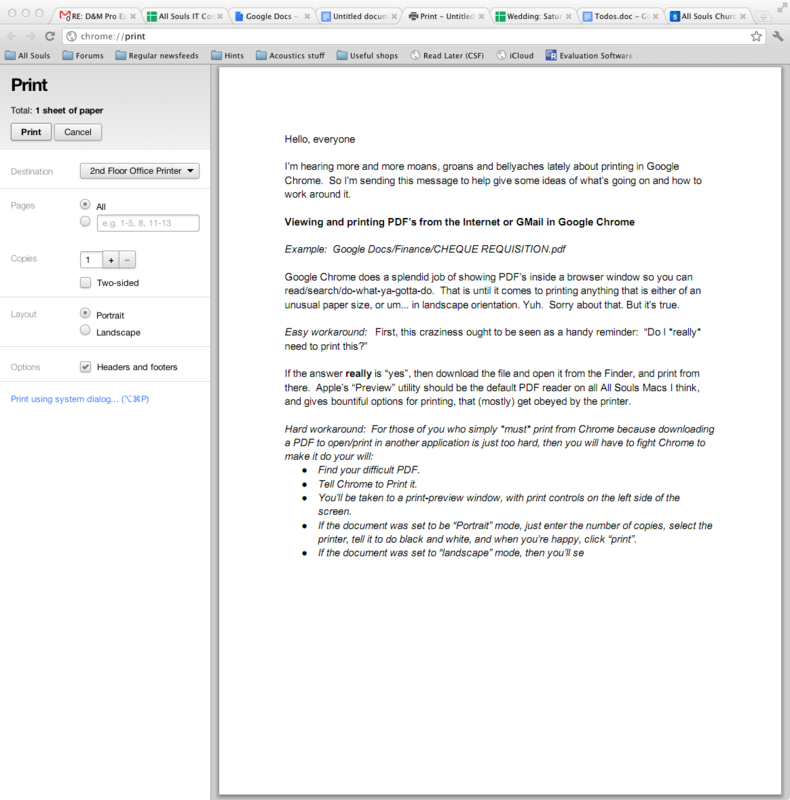 That is until it comes to printing anything that is either of an unusual paper size, or um… in landscape orientation. Yuh. Sorry about that, but it’s true. And it looks like Google might not get around to fixing that anytime soon. Print from the PDF viewer. Find your difficult PDF on whatever website/online email account and open it in the browser. Tell Chrome to Print it. You might find that a single-page document gets another blank page added to the end. I don’t know why. If it’s a single-side document, tick “Two sided” and the blank page will get printed on the back of the page you want. If the document was set to be “Portrait” mode, just enter the number of copies, select the printer, tell it to do black and white, and when you’re happy, click “print”. If the document was set to “landscape” mode, then you’ll have to tell Chrome *again* that you want to print in Landscape. Otherwise your landscape document will be printed in landscape on a portrait page. Then check the other options, sending to right printer etc. And you *should* be done. After getting this wrong a few times, as I inevitably do every time I try to do it this way, you’ll probably appreciate the “easier workaround” above.